A lovely day trip from Boston, Walden Pond is a large, crystalline lake, surrounded by tall trees and walking paths. Henry David Thoreau lived alone near its shores in the 1840s and was inspired to write his famous work, Walden. Today, many families visit to spend time outdoors and swim in the lake, and the Massachusetts park service runs a visitors’ center nearby with information about Thoreau’s life. A replica of the tiny house Thoreau built for himself sits close to the center; a reminder of his call to live simply. I visited in September with friends and was captivated by Thoreau’s house. It looked surprisingly like the tiny houses of recent social movements, aimed at either helping the homeless or getting stressed-out city dwellers to downsize and simplify. Suddenly I was envious of his project to live alone by the lake. I’d never read Walden; it was time to pick up the book. Walden is a first-person account that’s part nature study, part self-help, part political critique. Thoreau meanders for long passages but then makes a sharp point that seems right on target for 2018. Most pointedly, he talks about how quests for money, property and prestige tend to complicate our lives with pointless worry. Henry David Thoreau, 1856. Daguerreotype by Benjamin D. Maxim. On the day of our visit to Walden, I spent a pleasant day on its shores with my friends and their children, eating a picnic. My partner, a serious swimmer, swam across Walden and back and wrote his own thoughts on it. Though Thoreau’s life in one way seems very long ago, in another way it’s quite immediate. Many things about Walden, both the book and the place, will stay with me. I traveled to Germany recently to talk about fact-checking and U.S. politics at the German-American Institutes. Here are some photos from the trip. Earlier in November, I was a guest speaker at Festival 3i in Rio de Janeiro, where I talked about fact-checking in a partisan environment. Here are some photos from the trip. MADRID — For the fourth year in a row, I’ve gathered with fact-checkers from around the world to discuss best practices and highest principles, with lots of time for socializing. We come together to confab, commiserate and encourage as we all go about our work of holding the powerful accountable and giving our readers the facts on what’s true and what’s not. I saw two major themes at this year’s conference: technology and trust. For technology, Bill Adair of Duke Reporters’ Lab showed us the latest on automation and Share the Facts, coding that allows fact-checks to be shared and highlighted in search findings. Meanwhile, the UK fact-checkers at Full Fact showed us how they’re using automated processes to identify and flag false statements and then present corrective information simultaneously. Both efforts are exciting and point to new ways of getting accurate, vetted information in front of people on the Internet. Interestingly, basic trust struck me as the trickier issue. Several speakers mentioned the high levels of partisanship among the general public, a.k.a. our audience. That partisanship sometimes makes people hostile to fact-checking or evidence-based findings that contradict their world view. As one academic put it, partisanship is a social identity, not a cognitive tool. That means people can perceive fact-checking as threatening (or bolstering) to their own sense of identity, instead of simply seeing fact-checks as information that helps them make decisions. Reaching out to audiences that are suspicious of fact-checking remains one of our most important tasks, and we’re still figuring out the best ways to understand and address their concerns about our processes and work. The International Fact-checking Network, which grew out of the first year’s conference, hosted this event and announced new grants to increase fact-checking’s reach around the world. The next few years will be exciting, and I’m already looking forward to Global Fact 5 in 2018. The PolitiFact team recently visited Buenos Aires, Argentina, for the third annual Global Summit on Fact-checking. 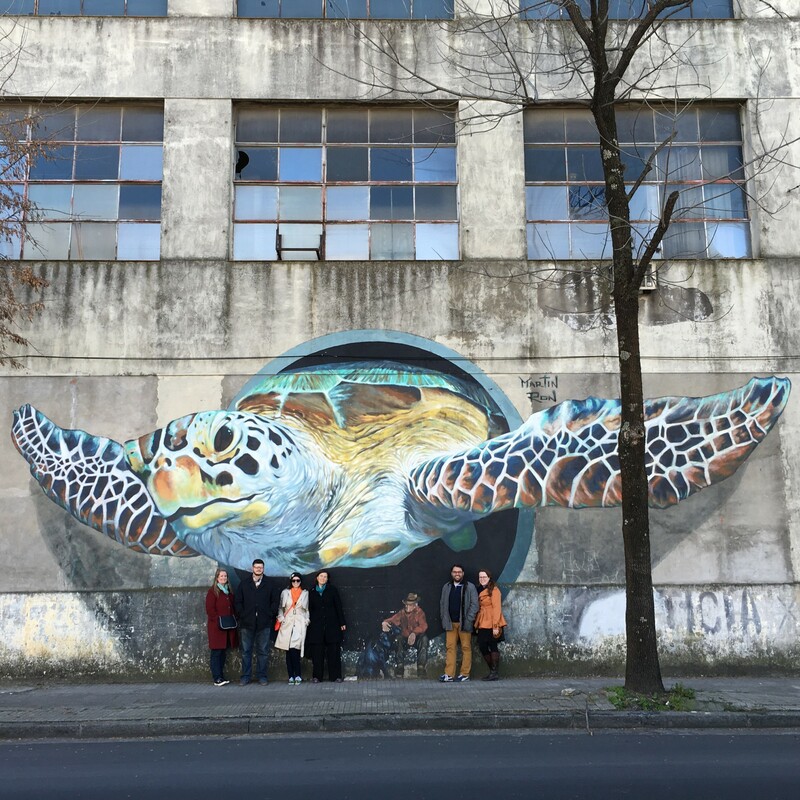 I’ll be posting more on this soon, but in the meantime here is a photo of some of us with street art in the city. Here’s my op-ed for PolitiFact and the Tampa Bay Times, summing up PolitiFact’s 2016 visit to Iowa to cover the presidential candidates. DES MOINES — The art and craft of political fact-checking is not much to look at, usually. We sit at desks and read transcripts. We watch politicians on TV. We read documents and reports. On lively days, we talk with national experts on the phone. Every now and then, we might have a heated conversation with a press secretary. So when PolitiFact decided to send a small team to Iowa, I jumped at the chance: Fact-checkers unbound from their desks! READ MORE. Our team went to Iowa recently to cover the caucuses; we snapped this selfie quickly on our way to a campaign rally. From left to right, it’s me, reporter Lauren Carroll and deputy editor Katie Sanders. With summer coming to an end, it seems appropriate to post this list I wrote up for a friend: my recommendations for books to read on vacation. To Rise Again at a Decent Hour, by Joshua Ferris. Irreverent and funny. A dentist gets his identity stolen and has a run-in with an invented religious. The Goldfinch, by Donna Tartt. Modern Charles Dickens-like tale about an orphan and a stolen painting. Fascinating sub-themes of alcoholism and addiction. Cloud Atlas, by David Mitchell. Nested short stories: historical, romantic, detective, farce and futuristic. The subtle but overarching theme is humanity’s own predation on its members. David Mitchell is a big favorite of mine.